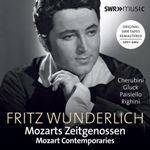 Fritz Wunderlich (1930-1966) remains a touchstone for lyric tenors, and this recording, the sixth of a series devoted to him on the SWR Music label (SWR = Southwest German Broadcasting), gives full affirmation of his exalted reputation more than half a century after his untimely death. The notes give some detail about the remastering of the original tapes. The results are terrific and the CD is an aural pleasure. The main conductor here is Emmerich Smola (1922-2011) who was an early mentor of Wunderlich. He isn’t well-known and his career was centred with SWR in the relatively small city of Kaiserslautern. His approach, and that of Hans Müller-Kray, has everything very nicely falling into place. It is refreshing to come across a group of little-known (or unknown) arias from an era we think we know, thanks to the exhaustive coverage of “everything my Mozart.” And at least three of the composers can be classed as obscure: Ignaz Holzbauer (1711-1783), Johann Friedrich Reichardt (1752-1814), and Vincenzo Righini (1756-1812.) It all makes for terrific listening, although a major drawback is the absence of texts. The highlight is a nice sampling (four tracks) from Luigi Cherubini’s Les Deux Journées ou Le Porteur d’eau, known in German as Der Wasserträger. The infrequently-performed work is noted as an inspiration for Beethoven’s Fidelio, and these excerpts provide evidence. The fact that it is sung in German translation (as is the Gluck aria) is no barrier to enjoyment. I have reservations about soprano Elisabeth Verlooy who joins Wunderlich on four tracks. She has a tightly-focused tone with a squealy quality (reminiscent of Toti dal Monte and Pierrette Alarie.) It is now a period style that lyric sopranos no longer cultivate. Eight other singers are featured on the Cherubini tracks and all come across decently. In addition to the arias by six of Mozart’s contemporaries there are two bonus tracks, those by Alessandro Scarlatti and Handel. All in all, a treat for devotees of Fritz Wunderlich.